The aroma of food cooking makes everyone feel well. Pies are easy to make and even easier to eat. Sweet and savory, there is a pie to suit every taste. As pastry can be prepared in advance and kept in the fridge, or be frozen, a pie will provide an easy, quick, satisfying dinner or dessert to make everyone feel great because, when there is a pie in the oven, something smells good. Pies come in all sort of shapes and flavors. You’ll find pies made with top and bottom crust, pies with only a bottom crust and pies with only a top crust. 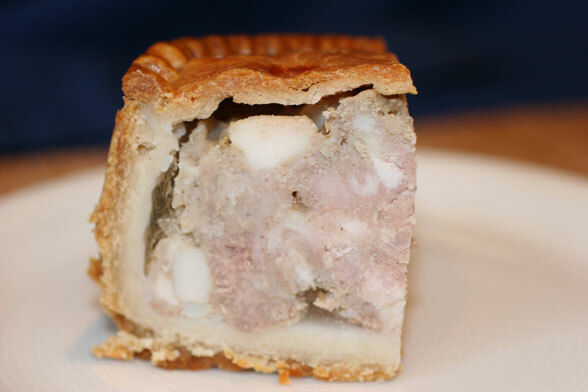 There are pies to eat warm and pies that taste better chilled. Pies with savory fillings that make a main course and sweet pies that make the most wonderful desserts and treats. Bottom crust only pies can be open faced - those are called tarts - or covered with a lattice top. Pies with only a top crust are referred as deep-dish pies. A pie is only a tender, golden-brown shell, ideally flaky and light, and a filling. The filling can be almost every food the sky. The pastry to produce that perfectly baked crust is the first step. Plain pastry is as easy to make by hand, as it is with a food processor. Plain pastry produces superb double crust pies or single crust ones. Plain pastry can be flavored to match the filling -making it suitable for both, sweet and savory, pies. Rich sweet pastry needs more careful preparation than plain one, however, it is ideal for sweet open pies –bottom crust only- and tarts that will need little more to be delicious, especially good with chilled pies as it keeps flaky for longer than plain pastry. Once the shell has been mastered, here comes the filling. Let us make it sweet. This pastry is an ideal container for a soft or semi-hard content. Place the filling at the last possible minute to preserve texture. 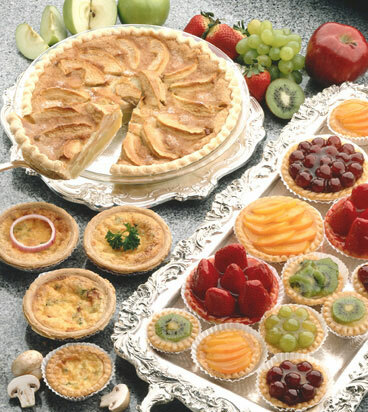 Soft fresh fruit – soft fresh fruit is an easy and popular filling for pies. Use small, regularly shaped fruit whole, slice or dice fruit with large, irregular shape. Arrange the fruit over the cooked shell, drizzle generously with warm jelly, jam or marmalade to give it a shiny finish. The pie is ready to serve once the glaze has cooled down. Poached fruit – poached fruit makes a great filling. Be careful not to overcook the fruit, not only it will become too soft and unappetizing, the excess of liquid will spoil the crust. Glaze the surface of the crust to make resistant to juice, before layering the fruit. Always drain the fruit well to remove excess juice. Canned fruit – canned fruit is an instant, ready-made filling. Drain well. Puréed fruit – puréed fruit is great on its own and better if combined with something else, such as lightly whipped cream. Make the fruit puree thick and very tasty. Flavored jelly – use flavored jelly as a base, combined with some whipped cream, thick fruit puréed, whipped egg whites, or fresh fruit, as jelly’s texture does not make a good match for the crust when on its own. Pour the jelly when it has the consistency of egg white, maybe a bit thicker. Liquid, hot jelly would soften the crust and solidified jelly would not take the shape of the crust. Whipped cream, soft cheese or yogurt – use mixture of these as a creamy base. For a creamy filling with half the fat, blend equal amounts of soft cheese and yogurt -mix in powdered sugar to taste- spread on individual cooked pie shells and sprinkle toasted, flaked almonds on top. Mix and match a base and fillings. Glaze with warm jam, if desired. Whip cream, flavor with a few drops of vanilla essence and powdered sugar to your taste, spread over the pie shell and top with seasonal fruit arranged in rings. Spread mashed bananas -add 1-2 tsp lemon juice to the banana purée to prevent discoloration- over the bottom, top with red and white grapes –no seeds- arranged in alternate rings. Blend 4oz soft cheese and 4-5 Tbs whipped cream, add confectioner’s sugar to your sweet taste. Distribute among 6 individual fully cooked pie shells. Top with 2 cups prepared strawberries –wash, remove stem, slice large strawberries, leave small ones whole- and glaze with 3 Tbs strawberry jelly, warmed just until liquid. Leave to cool or chill until the glaze has turned solid again and serve. Substitute strawberries with any other berry, matching the jelly for the glaze to the fruit for the filling or use a berry mix. Substitute strawberries with sweet, drained canned cherries. Mix in 1-2 tsp kirsch to make them more interesting if you wish. Find sample pie recipes on the sidebar to illustrate how to use other kind of fillings - custard or starch thickened cream - or some double crusted fruit pies. There are references to including a low sugar apple pie and a couple for savory pies. Everything to get you baking, because, if the smell of a pie baking in the oven makes everyone feel good, a slice of home-made pie will be welcomed as the most comforting food ever, and even the rugged ones will feel almost in heaven when the pie is sweet. Book traversal links for Something smells good! A slice of sweet pie makes a delicious dessert or treat. A savory pie can be a healthy, hearty and onto budget family dinner or easy entertaining. Pastry is the first step to pies and tarts.